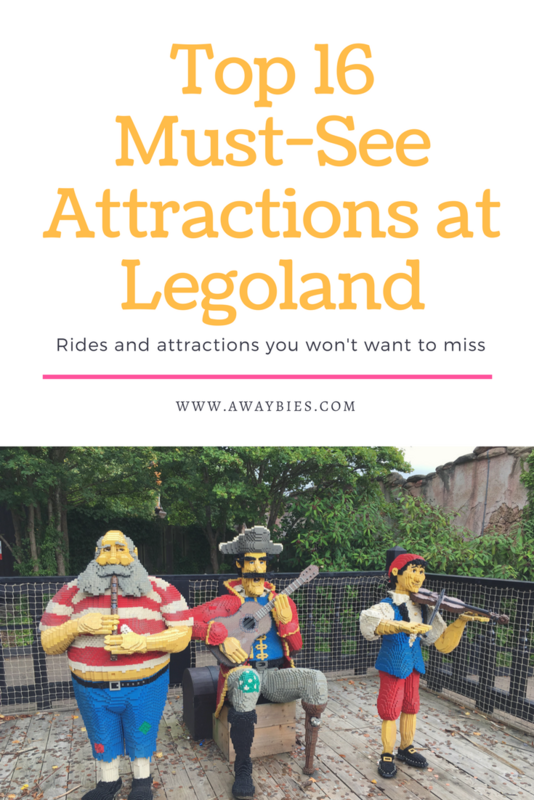 Going to Legoland Windsor? Below you’ll find a list of the top 16 attractions you won’t want to miss! Click to go to official website and book this offer! LEGO! I have a love-hate relationship with it. I mostly love it, and now that my kids are getting a little older and have sets of the small Lego, there’s almost nothing I like more than helping them build their models! Ok, so sometimes I build the whole thing…after they’ve gone to bed. But shhh…don’t tell anyone. However, I must say I do find it horrifying when there is a lot of Lego, mixed up, and spread all over the living room floor. Mainly because I know my husband or I will end up having to tidy it away. The older kids are pretty good about tidying when asked, but our youngest…he prefers to throw things! And not into a toybox, just in random directions. It’s a work in progress. Anyway…Legoland Windsor is a different story. How can one not love it? If you haven’t been to Legoland Windsor and don’t know, it is a theme park where almost everything is made out of lego! 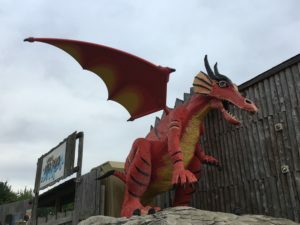 There are loads of rides, and play areas, and it is super child-friendly. I’d say the ideal age to enjoy it is 3 years and up, and my daughter who is 7 still enjoys it immensely and I suspect she will continue to for a few more years. We went as a family yesterday and it was her 5th visit! The 1-year old loved it as well! He didn’t nap ALL DAY as he was so excited. The first thing to know is that Legoland Windsor is not open every day of the year. It is open all summer long, but by September there are some week days when it is closed. It remains open for much of October, including half term holidays but by November it is mostly shut except for the 5th. It is then open again during the pre-Christmas period in December and on weekends. You’ll need to take a look at opening hours on the Legoland website. I can highly recommend, if you have preschool children, taking them outside of school holidays! The queues can otherwise be very long, and the crowds rather overwhelming. If you do find yourself going during the busy periods, you can look at purchasing the Q-Bot pass in order to spend less time queuing, which I’ve never used but I hear from friends who have, that it is worthwhile! We were lucky when we visited, as it was a school inset day for my kids, but a lot of schools had already started back. So it was lovely and quiet! There are also other hotels and B&B’s nearby, and Windsor is a great place to check out if you’re visiting the area. Admission to Legoland isn’t cheap, but you can save by booking online in advance. There are also annual passes and a 2nd day free offer, which is a smart idea as there really is a ton to see and do at the park so it would take the pressure off if you have 2 days to explore the park. Car parking costs £5 in the regular car park or £12 for the priority (closer to the park) area. Don’t forget to note where you have parked as the car park is pretty huge! 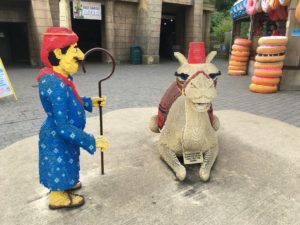 Here is a list of all the rides/attractions enjoyed on our recent visit and a brief explanation. All of the rides I’ve described are outdoors except for Laser Raiders and the Star Wars Miniland. 2. 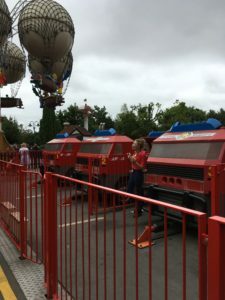 Laser Raiders – We had never been on this indoor ride before, but I am glad we tried it out! So much fun. It reminds me of the Toy Story ride at Disneyland Paris (another great place to visit that I’ll be reviewing soon!). You sit in a 4-person car, and it takes you from room to room, while you aim and “fire” a laser gun at various targets. You get a score at the end of it, just like in a video game. 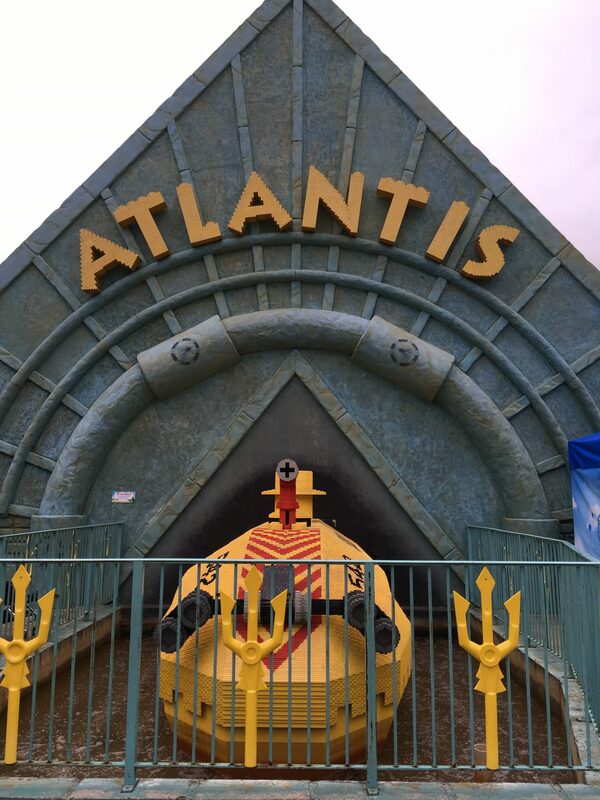 Admittedly our 3-year old found the ride a little scary as it is quite dark and there are a few skeletons popping up, but it is completely safe and the 1-year old sat still, transfixed for the whole ride! 5. Duplo Train – the smallest train I’ve ever sat on! I enjoyed this ride with the 1-year old. 7. Duplo Valley Airport – The kids insisted that we go on this one twice! Helicopters that you climb into, that go up and down and round and round in circles, which your child can control themselves. Incredible. 8. 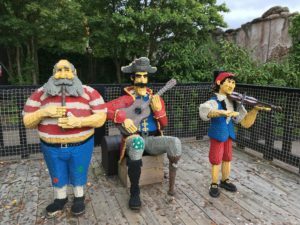 Heartlake Harbour Arena (Pirates show) – this show was fun for a break, to take the weight off our feet and enjoy an ice cream. Great for all pirate fans. We’ve previously seen a “Lego Friends” show here, and apparently this will return next year. Heartlake City is the “Lego Friends” section of the park, and is themed to look like a Lego Friends set. There are lifesize lego figures of the girls, which are fun to pose with! 9. 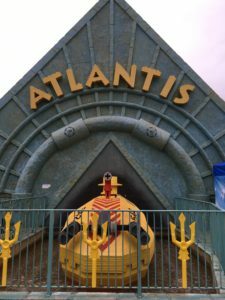 Atlantis Submarine Voyage – DO NOT MISS THIS RIDE! I won’t spoil it for you, but it is wonderful and the whole family can get on it together. 12. L-Drivers – The mini version of Lego City Driving School, this ride is for ages 3-5. 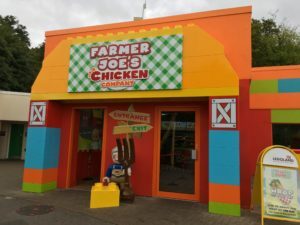 I highly recommend this ride if you have a pre-schooler, and if you arrive early and the park isn’t busy yet, head straight for this ride as the queues can be long and it is an absolute must-do! 13. Fire Academy – Drive a small fire engine, then spray real water at a make-believe fire in a house to save the day. Wonderful for all Fireman Sam fans. 14. 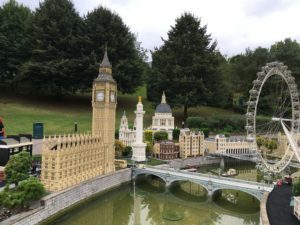 Miniland – Absolutely incredible display of what feels like every landmark in the world that you could ever imagine, made of lego. Usually not a busy part of the park, so great for a bit of a breather and break from rides. 15. Lego Star Wars Miniland Model Display – I don’t know why but I felt compelled to visit this display, even though I am not actually a Star Wars fan at all! I was still impressed by it, and I am sure any diehard Star Wars fans would be blown away by it. At the end you can take a picture with a life-size lego model of Darth Vader, while you hold a light saber. I insisted my daughter do this, even though she has no idea who Darth Vader is! 16. Vikings’ River Splash – My husband and I took our 7-year old on this white water rapids style ride, which is one of her favourites. Be prepared you will get wet! But we were pretty thrilled that we managed to enjoy so much of the park, not to mention exhausted by the end of our day so we will have to save the rest for next time! There are plenty of places to eat, buy drinks/snacks/ice creams at Legoland. We had lunch at this place, which has both indoor and outdoor seating and is near the Duplo theatre puppet show stage. The food was good although the burgers were a little on the small side. I recommend bringing some drinks and snacks of your own if you’re trying to save money, as these are on the pricy side in the park as one might expect. The Legoland shop is near the entrance/exit, be prepared that your children will demand lego products! I’m not sure what I mean exactly by “be prepared”, except that it is going to happen! Finally… I can’t recommend Legoland Windsor enough, it really is brilliant fun for all the family! You can click on LEGOLAND Holidays if you’re interested to book to go to Legoland, and would like to consider a stay at the Legoland hotel. This is an affiliate link, which means I do get paid a very small amount if you were to book through the link. Support from my readers allows me to carry on blogging and writing reviews. However I can assure you I only recommend places and products that I truly believe in! And read about our latest discovery, an essential parenting hack for Lego owners! This item is in constant use now in our household and I can’t actually do without it. weve never been but its definitely on our to do list for sure! 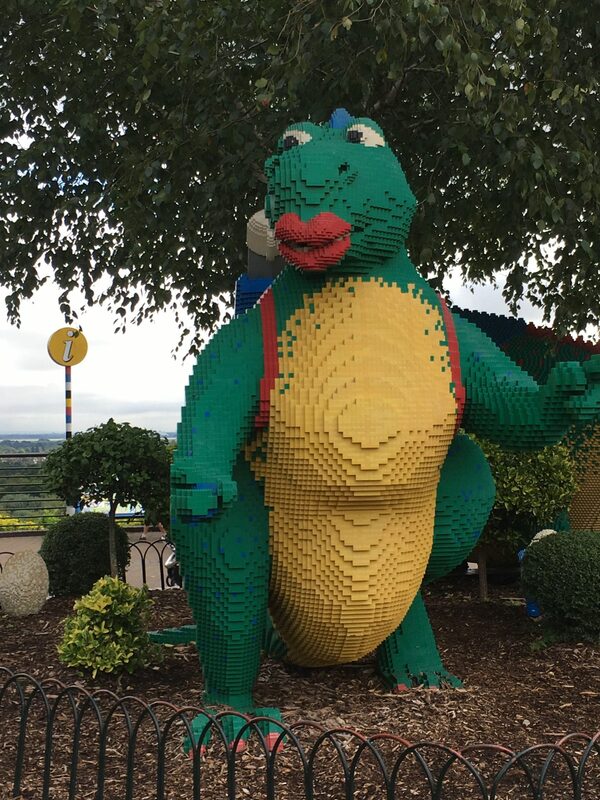 My daughter loves Legoland. I agree about going during school hours with preschoolers. If you’re doing that, get a preschool annual pass. 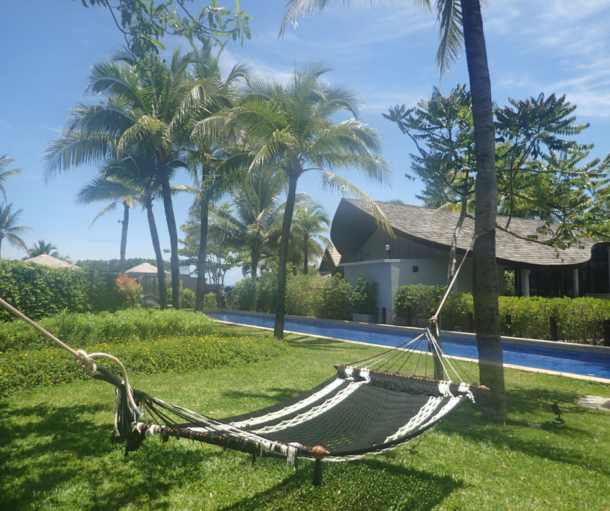 It allows term-time admission for the preschool child AND an accompanying adult. And it’s only around £75 for the year. Go once or twice, and you’ve got your money back. Ours is expiring next month, but it’s been a fantastic investment. I’m probably going to have to look into annual passes after that. Oh you’re absolutely right, the preschool pass is a real bargain!